LITERATURE DROP AND HOT CHOCOLATE - 2-3:30pm Sunday December 11 at the Strongsville Panera - Support Clean Energy Standards in Ohio! This literature drop is a quick response to the vote that was taken this week - ahead of schedule - by the General Assembly. It's crucial that the governor veto this continued freeze on Clean Energy Standards and that voters make elected officials aware of who they work for and represent. 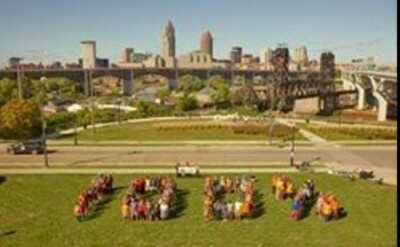 Freeze on Renewable Energy Standards In 2008 Ohio joined the modern world when the Ohio General Assembly passed a bill that called for renewable energy and conservation standards by the electric utility industry. In 2014 the General Assembly voted to "temporarily" freeze the standards. The freeze was due to expire at the end of this year until the the General Assembly voted early this morning to extend it. Although Governor Kasich has said he would veto the extension we cannot be sure. 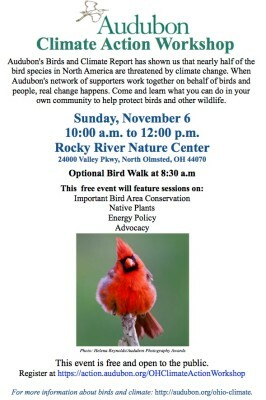 Please join us on Sunday at 2 pm at the Panera Bread in Strongsville (17090 Royalton Rd. Strongsville 44136) where we'll be distributing leaflets to be delivered to nearby homes letting Strongsville residents know that State Representative Mike Dovilla and State Senator Tom Patton voted for extending the freeze. 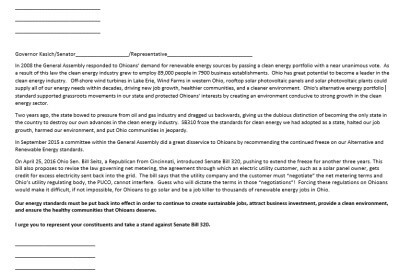 Please contact your elected officials and urge them to reinstate renewable energy standards in Ohio. West Shore Fact meets on the 2nd and 4th Sunday monthly from 12:30 to 1:30 at West Shore UUC on Hilliard Blvd. The Ohio Health Registry is gathering information about health related effects of the fracking industrial complex. Registration is ongoing. Please contact ohiohealthregistry@gmail.com for more information.